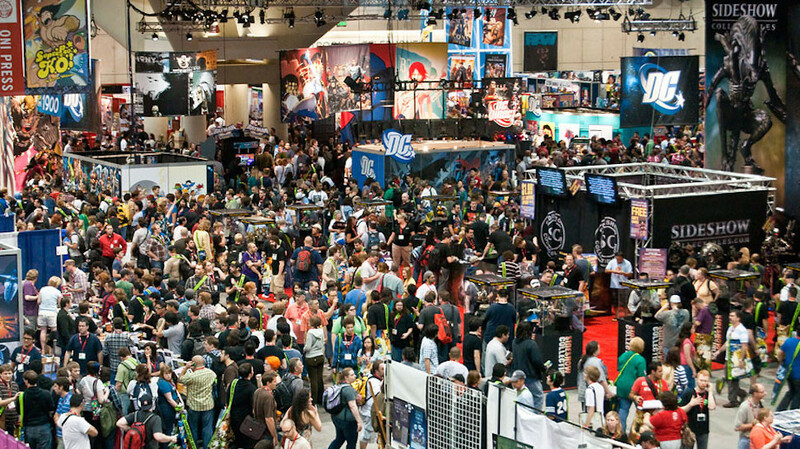 Action Figure Insider » #FlashbackFriday : Toy Rescue! 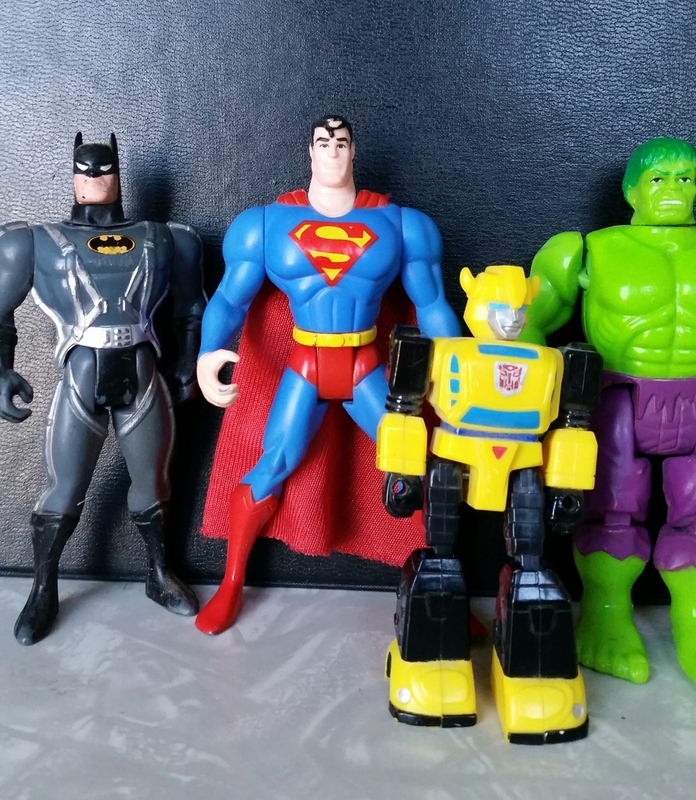 Today I take a brief look at some toys that I was able to salvage from my childhood home. My sister was helping in cleaning out the garage while my parents moved out of their house. We were able to Facetime so that I could pick and choose some beloved toys that I couldn’t see get sold/donated/or worse. Below I break down the toys into segments and briefly describe what was chosen. 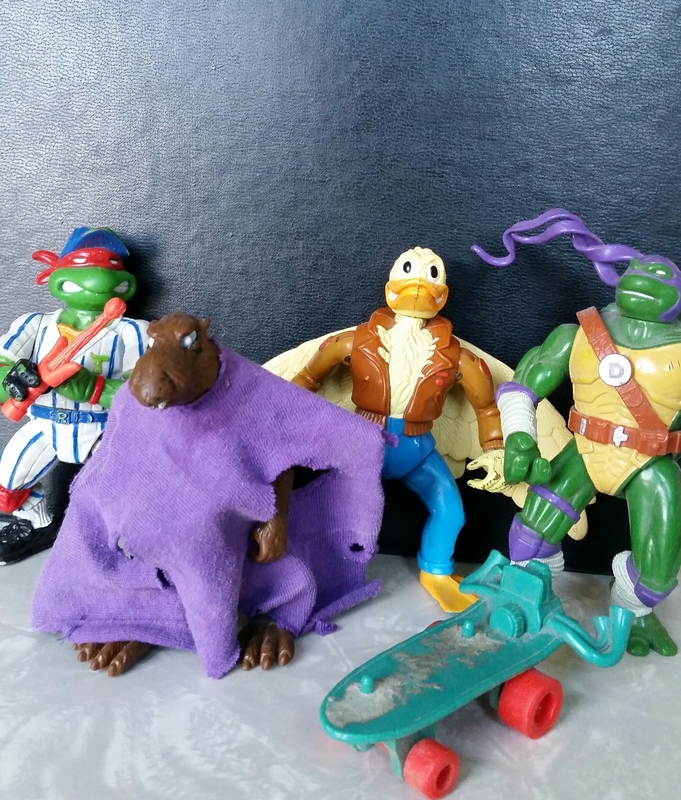 These are assorted Ninja Turtles figures from the early 90’s. 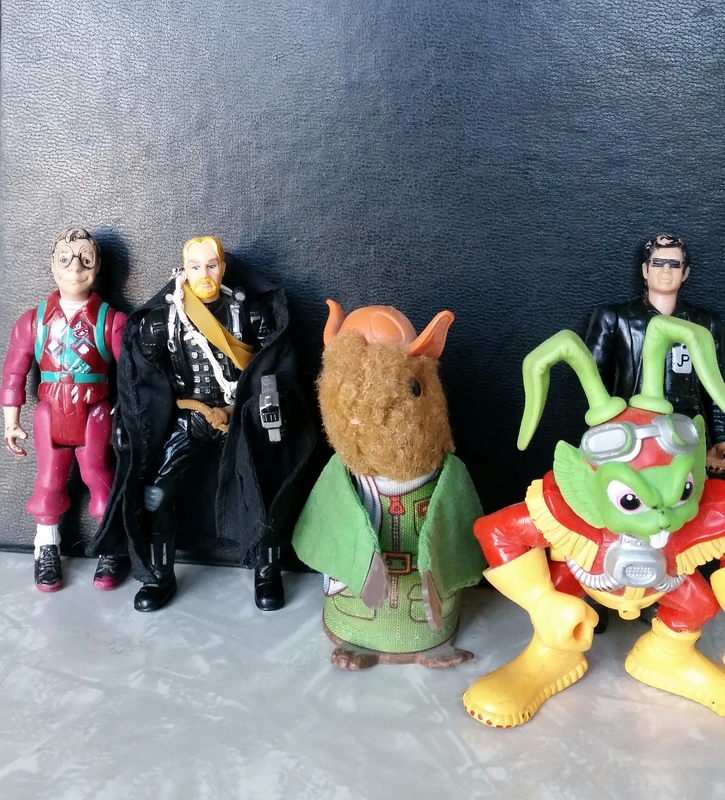 Ace Duck and Master Splinter being the oldest of the group. The Baseball Player Raph was a later addition, the random skateboard an errant accessory from a Mondo Gecko (I figure I don’t recall having but I believe I did a trade with a cousin for just the skateboard). The Donnie figure is actually my younger brother’s and is part of the Next Mutation line of figures (based on the horrible live-action show), I just liked the way he looked and took pity on him. This is a fun grab bag of figures, mostly from McDonald’s. The Frankenstein Homer is from Burger King and I’m pretty sure a friend gave that to me in high school. 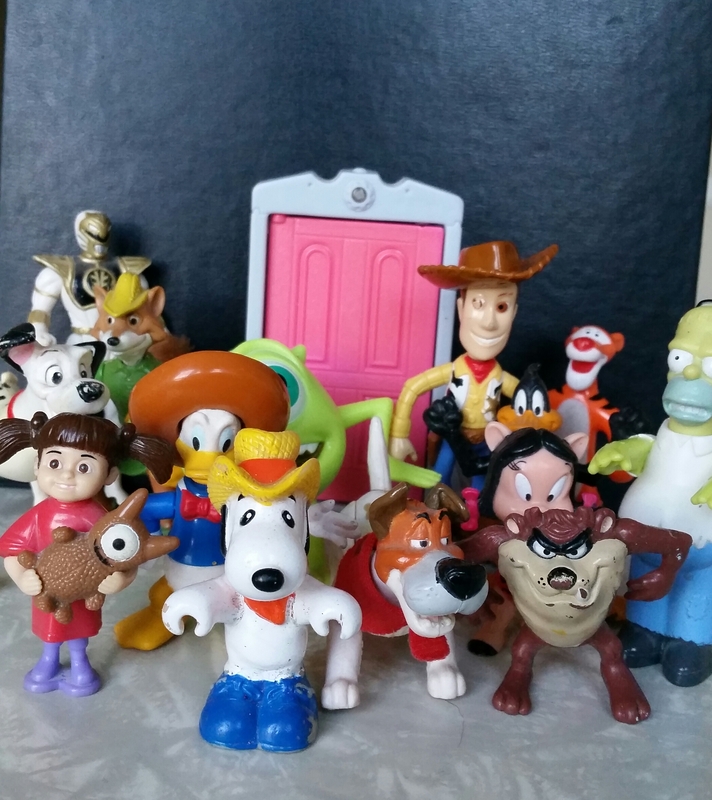 The Woody figure has the most wear because he was a figure I played with regularly and was part of my go to group of figures before transitioning out of playing with toys. A couple, including Mexican Donald Duck & Robin Hood, hold no inherent sentimental value but harken to a not too long ago era of high quality figures from McDonald’s that I wanted to preserve. That Snoopy however will always be in my heart and I’m glad to have him back. Like most toy collectors of the late 80’s and early 90’s, we couldn’t have enough variant Batmen. I had purple, orange, green, blue, white Batmen from several lines but mostly Batman: The Animated Series. This Bat-variant was actually my first BTAS figure that I ever got (the closest to being on model that I owned) and probably my second Batman toy ever (the first being a long gone 1989 movie Batman). The Superman was a Clark Kent to Supes figure that actually has aged quite well. Bumblebee and Hulk both came from my 4th Grade Teacher that had a stash of toys and books that she would sell to us using her own sort of in class currency that you had to earn. The Hulk I bought mint on card and has held up very well. 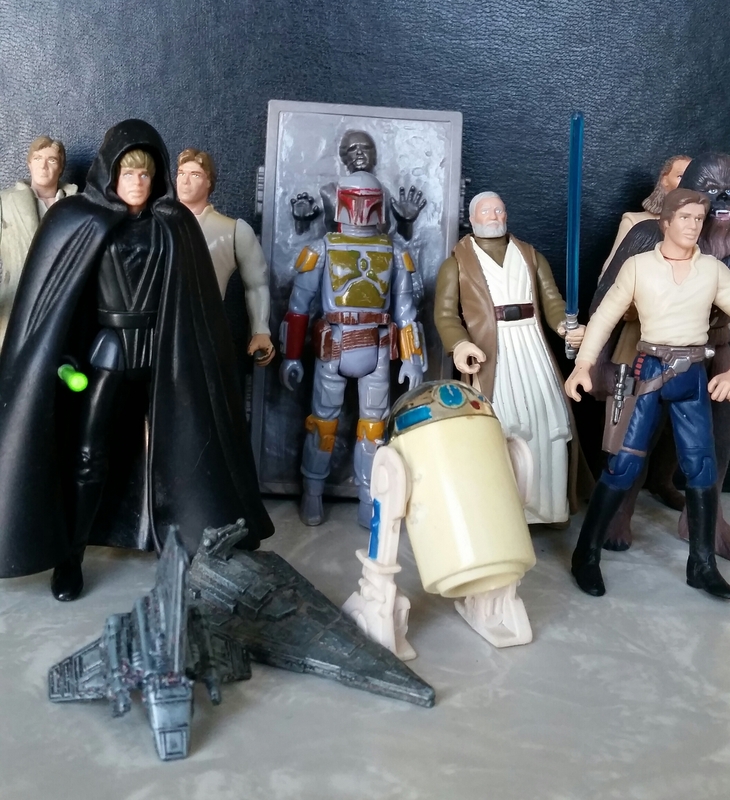 Being of a slightly younger generation (compared to some collectors) I didn’t get into Star Wars toys until the rerelease of the movies in 1997. I had a ton of them though bleeding into my teenage years when toys weren’t that cool anymore. The vintage Boba Fett & R2D2 you see were scammed off of a kid from a younger grade in elementary school that didn’t know any better. The small ships were premiums from Sabritas Chips in Mexico. This is just an odd bunch of figures that don’t belong together. The Squirrel is a Fisher Price squeak toy that my Grandfather bought for me at a flea market. Bucky O’Hare was purchased at the very brief height of Bucky O’Hare. Louis Tully is my only surviving Real Ghostbusters figure, I played with him as a child but didn’t remember his last name so I gave him a new one, Kravitz. Ian Malcolm was actually my brother’s but he notoriously never took care of his toys like I did (I started displaying my figures in the 3rd grade) so I made a trade with my brother when we were kids so I could play with what I thought was a cool looking figure. Finally I have to mention John Robinson from the Lost In Space movie. I really liked the figure, did not like the movie, so I made him into somebody else using the power of imagination! He was a very different character when I played with him, hence his strange attachments. My most played with toys always had rubber bands on them so that I could holster their weapons. These figures run that gamut. A few them are from their respective action figure lines, Buzz Lightyear is actually one of, if not THE last toy ever purchased for me. I was in middle school and obviously no longer “into” toys but my mom saw me looking at the Buzz from the Toy Story 2 toy line and decided that it wouldn’t hurt to get me a toy for my birthday. Chip and Dale (Rescue Rangers) were cereal box toys, while Timon & Zazu (the bird) were special premiums from Bimbo that I got at my Grandma’s house one summer in Mexico. 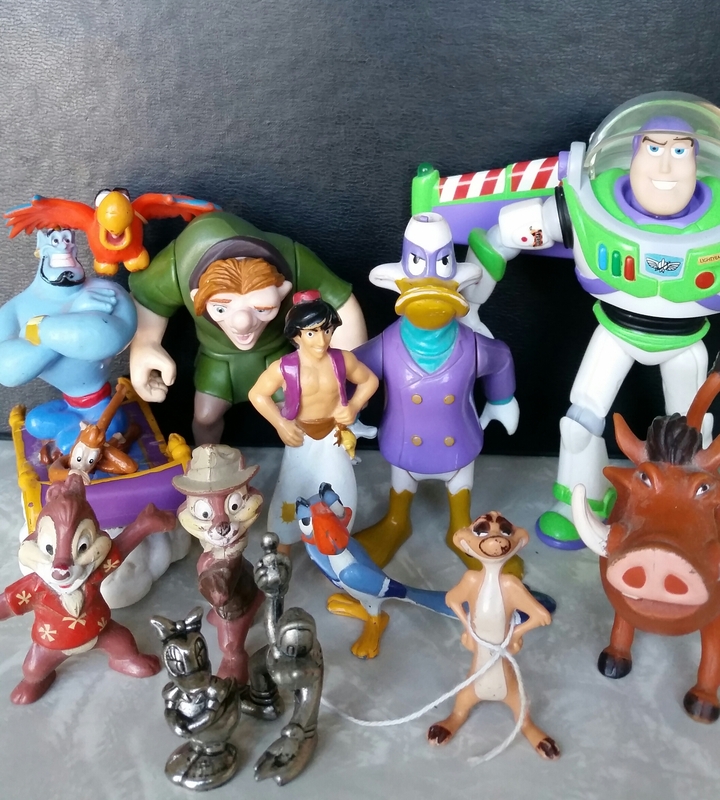 The rest are just store bought figurines, I do know that Genie is from a trip to Disneyland. So there you have it, a brief look into my toy past. As a collector there is no pain greater than the one(s) that got away so I’m happy to have these back in my possession and collection. Shout out to my sister Laura for helping and transporting them from Texas to New York to California for me!